On Wednesdays we are thrilled to fling open the doors to all of YOU! We love hearing your dreaming stories…the lessons you’ve learned, the roads you’ve walked, the dreams He’s planted in your hearts! Today we are excited to welcome Kristine Brown to God-sized Dreams. She shares the sweet reminder of what God can do when we choose to wait on His perfect plan for us. Thanks for being here today, Kristine! I laugh often about my deficiency in the area of yard maintenance. When it comes to gardening, even the simplest task leaves me fumbling. So imagine my anticipation as I witnessed bright green tulip leaves and stems peeking out from the soil in the flower beds of our new home. Well, I was pretty sure they were tulips. My excitement grew daily as the mysterious stems reached closer and closer to the sky. I knew one day soon they would burst forth to add a bit of color to an otherwise drab landscaping job. But what’s a gardening-challenged girl like me to do? I didn’t know the first thing about caring for tulips. So I studied. I prayed. I consulted experts in the field for advice. OK, I called my friends, but that counts, right? However, with all this detailed preparation and time-consuming effort, I never once considered that something unexpected might bloom. Our dreams can be like these flowers. We know exactly what we want to happen. We plan. We study. We pray. We devote the time and energy necessary to foster the dream and watch it come to fruition, but God has something unexpected ready to emerge. When God plants a dream in us, it’s important to understand and accept our part. (<====Tweet this.) Our role is to cultivate and prepare the dream, walking faithfully in the sometimes monotonous tasks entrusted to us each day. Yes, it may get tedious at times. We may even be tempted to give up, but God reminds us in His Word that perseverance builds character! Steadfastness and trust feed the dream exactly what it needs to develop. I’ll never forget the day one prized tulip burst open in the middle of a weed-ridden flower bed to share its beauty with the world. Only, it wasn’t a tulip. 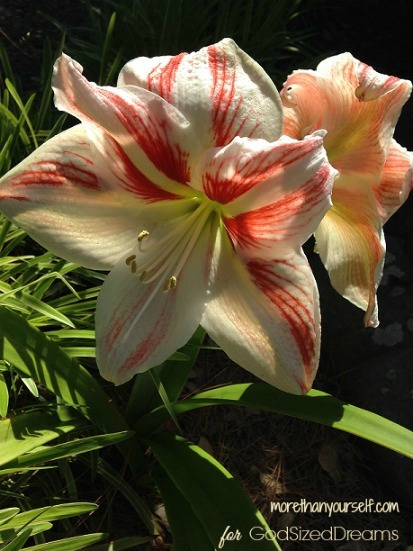 Huge, pearl-white blooms with delicate, painted brush strokes of red and yellow stood out with confidence. Neighbors passing by on the street would even stop to take notice. I was surprised by this amaryllis, (yes, I had to look it up,) and also reminded of a simple truth. The end result of the dream is entirely up to God, and I am assured by Him it will be beautiful beyond anything I could ever imagine. 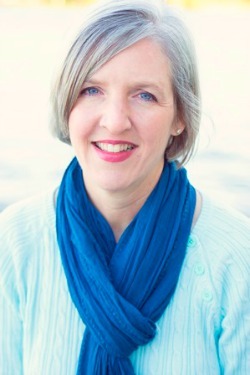 Kristine Brown is a writer, speaker, and English teacher. She shares a message of contentment over comparison, and her desire is to encourage positive spiritual growth in women of all ages. When she’s not experimenting with a new recipe for the crock pot, she can be found planning outreach events at the local community center. Kristine shares weekly devotions, inspiration, and humorous stories on her blog. She lives in Texas with her outgoing teenage son and her supportive husband who actually likes doing the dishes. You can also keep up with her on Facebook. Beautiful and true words today, Kristine! Thank you for this reminder that our dreams may take a different form that WE expected, but God’s dreams are so much better than our own and in His time and His will and His way they will form perfectly. <3 Love having you here. Thank you Lisa. Blessings as you continue to do your part and watch God work in and through you! Beautiful Kristine! I so love when God surprises us with unexpected beauty when a dream changes! So glad to read your words today Kristine. This is a great reminder to trust the results to Him and stay open to His surprises and twists as we cultivate the dreams that He has given. Nice to see you here! Thank you for the encouraging words, Katie. I love God-surprises, don’t you? Haha! Thanks, Betsy. Me too! Thank you so much Jana. It will always amaze me how much more God has planned for us. More than we can imagine! Blessings, friend. Beautiful story! I love it when tulips turn into something unexpected and more beautiful! God’s plans are so amazing, aren’t they? Thanks for the comment, Ashley! Love this, Kristine – He is the author of amazing dreams – beyond our wildest! Yes, hallelujah! So thankful for God-given dreams today, Tiffany. Thank you for the comment! God is telling me something today, as I keep reading about plans and dreams and letting God take control. Thank you for letting God use you to speak to my heart. I’m so glad I can count on Him to take control and do His planning. This is beautiful. What we hope will bloom sometimes blooms differently but even better than we can imaging. Thank you for sharing. God’s dream often doesn’t turn out the way we expect it to. The Lord has really be working on me lately to understand what He has called me to. This is a timely post for me to read. Thank you, Kristine!